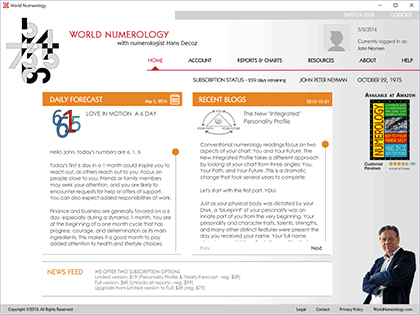 The layout of our numerology software on PC, Mac, and iPad, is horizontal. On iPhone and Android, it's vertical. Choose any name to identify this user (it will not be used in the actual report). Enter the full name exactly as it is listed on the individual’s birth certificate, even if it is not the name used now. Do not include spaces, other characters, or extensions such as Jr, III, etc. Adoption: In the case of adoption, use the first known name, whether given by the biological parents or the adoptive parents, even if that name was only used for a few days or weeks. Generally, in case of doubt, use the name given by the biological parents. Do not use generic names such as Jane Doe. If you are unsure, use the name you feel most closely fits you, then use the Name Advisor for people to learn how the alternate name may have affected you as well. If you want more complete information, do a full Personality Report on the alternate name. Foreign Names: The app currently does not support names with foreign characters. Use only names that use the 26 letters of the English alphabet. Enter the first and last name you currently use when introducing yourself in social settings, even if you usually just give your first name. Do not use your middle name unless you commonly use it daily. Do not use your business or pen name unless you also use it socially. When to include your middle name: Your middle name should be always be entered in the BIRTH NAME column even if you have never used it. Some cultures do not use a middle name, in which case this field will be left blank. Your middle name should NOT be included in the NAME YOU USE NOW column unless you use it consistently when introducing yourself in social settings. Nicknames: If you consistently use a nickname as your first name, even if it is not considered a “real” name, use that. When in doubt, ask yourself what you would say if someone woke you abruptly from a deep sleep and asked your name. 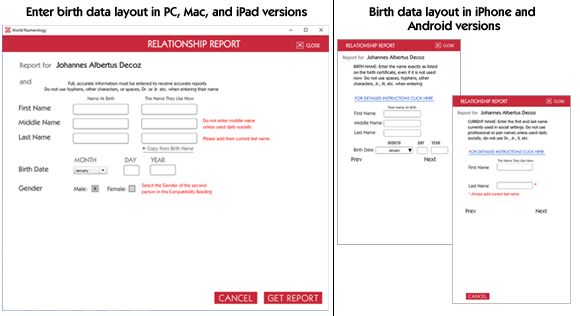 If you made reports before making changes to the name, you will need to reset the readings in order to get accurate based on the newly edited birth data. See below. Some reports are stored permanently in your app's memory. 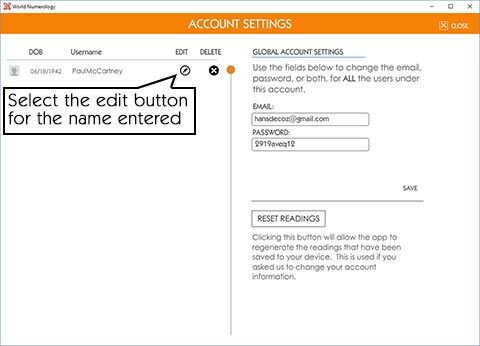 If you made changes to a user's birth data you need to remove them by clicking RESET READINGS on the ACCOUNT page of your app. Remember, to obtain an accurate reading, you must know the full name at birth, date of birth, and the name each person currently uses to introduce themselves (if different from their full name at birth). 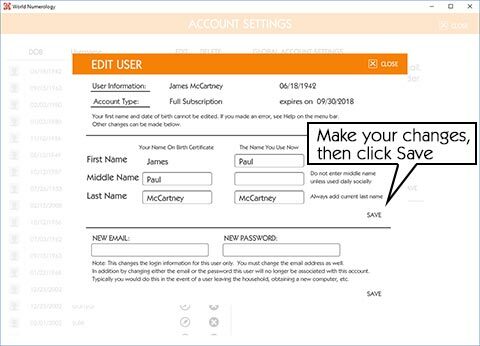 To add a new user, click SWITCH USER (top right corner on the program's home page), then select ADD USER and fill in the field boxes. Select their name on the SELECT A USER page then go to Readings & Charts to view their free reports. To purchase reports for your new user, click any gray icon, then Upgrade Here under the description on the left. You can then send their subscription. To select a different user on your list, click SWITCH USER (top right corner on the program's home page), then click the name you wish to view. To delete a user, go to ACCOUNT in the menu bar and click DELETE next to the person’s name. Enter the name of the person you want to check your Relationship Compatibility with. Enter the full name at birth, as shown on the individual’s birth certificate. Do not include the suffix Jr., Dr., III, etc. The current or short name is the name used in a social setting, including the last name. Add your friend to your users page (see above), then just switch user to your friend's name and select the Personality Profile icon on the Readings and Charts page. From the HOME page, click READINGS on the menu bar. 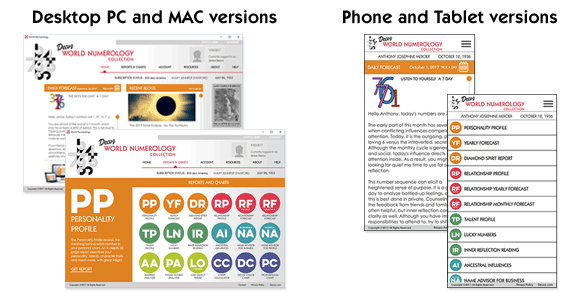 Icons that appear in color on this page are accessible immediately. Icons in gray require purchase. To purchase a subscription, click any gray icon, then click UPGRADE HERE on the left under the report’s description. Choose your Subscription Level and follow the prompts to pay by credit card or Pay Pal. For mobile versions click here... Note: Once purchased, you can access your readings from any device you download to . Just use the same email and password for each device. To print a report, open it on your app, place your mouse in the window showing the reading, then select All and copy and paste it into a word document. When your subscription expires, the icons on the Readings & Charts page revert to gray and a pop-up message appears to alert you to the end of your subscription. NOTE: If you have an iPhone or iPad, purchase from your computer, then access readings from your mobile device as well (iTunes does not use promo codes). *We do not auto-renew. you will receive an email with renewal options about a month before your subscription expires. The email includes a link to a personal discount code that substantially lowers the cost of your following year’s subscription. This ensures you don't pay twice for the lifetime reports (Personality Profile and Talent Profile). 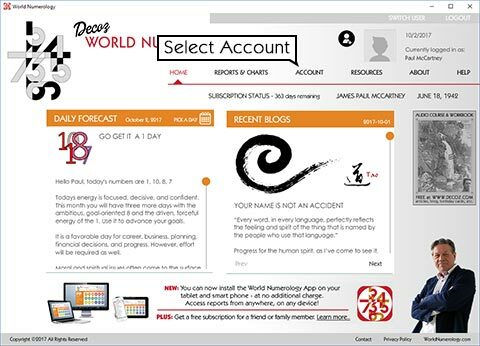 If you missed our Promo Code email, write to us at 2worldnumerology@gmail.com and we will send one. Create a New User and enter your own birth data (choose a different User Name so you can tell them apart). Go to Readings & Charts and click any gray icon. If you are renewing early to look ahead at your Yearly/Monthly Forecast, you have the option to purchase that reading individually here. To update to the most recent version of your software, or to install your software on other devices (you can install on as many devices as you wish without additional payment), click here.. Enter your email address on the app's login screen and click the blue link “I don’t know my password”, then check your email. You can easily change your password via our email. Go to “Account” on the menu bar and follow directions. 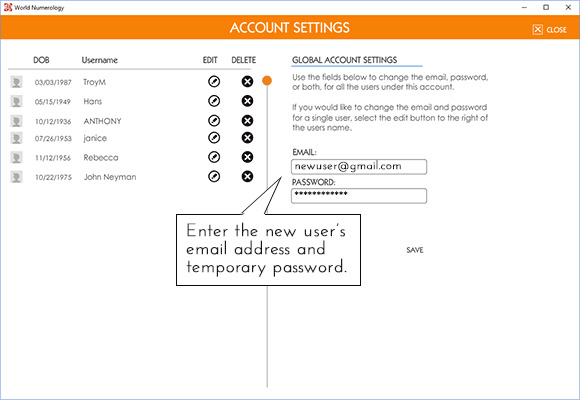 To change the email and/or password for ALL users, click Global Settings and change your contact information. This is used if you wish to log in to your account with a different email or password. All users you have added will move with this new information. To change a single User, click Edit next to the user’s name. This is used when a someone leaves the household, or when purchasing a Gift Subscription for another user. Note: Once you change an individual user’s email address, they will no longer be visible on your account. Be sure to give the user the email address and password you created for them. They can change their login information after downloading the app. When reports don't show up, it is usually due to slow internet connection, in which case you just need to give it a few minutes. Sometimes, if you have an older device with limited memory, the larger reports (Personality Profile, Diamond Report, and Talent Profile) won't show up. Freeing up memory may solve the problem. A registered user is the person who installed the app on his/her device. 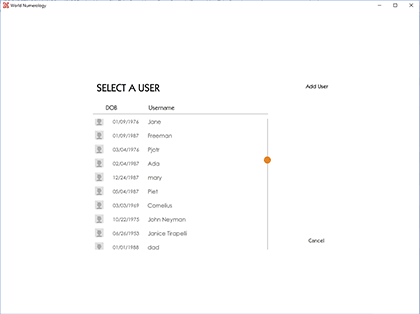 Added users are those whose names and dates of births have been added by the registered user via the Switch User > Add User feature (top right corner of the home page). 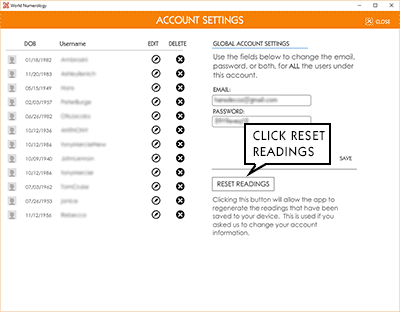 Guest users are users who access their reports from another registered user’s computer. The Daily Forecast applies to the user whose full name and date of birth are shown below the menu bar. To read the forecast for another name on your list, click SWITCH USER (top right corner) and choose the name you wish to view. Clicking the small calendar on the orange Daily Forecast bar allows you select the forecast for a different date. Ask for their email and password so you can log in using their account to purchase a subscription using your credit card or PayPal account. They can change their password later if they desire. Click the SWITCH USER link (top right corner). 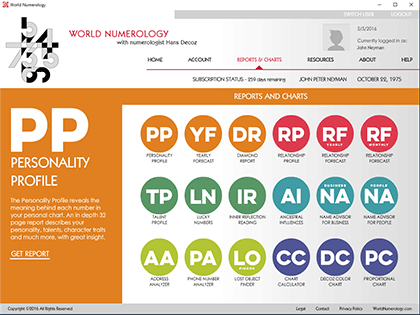 Have the recipient download the World Numerology App and complete the registration process using the email and password you provide. Their readings will be viewable immediately. Free and paid reports may be accessed by clicking on the Readings link in the menu bar. The 3 reports that are in color at the bottom of the Readings page are free and accessible immediately. Reports appearing in gray require purchase (see PURCHASE REPORTS above). Once you have purchased a report, simply double click the icon to view, or click GET REPORT under the description on the left. Try closing the app and reopening it. This can also happen if you use two computers. If you update your information on one computer, then later access the app on your second computer – you will need to close the app and reopen it. This should update your information. If you included an apostrophy or a hyphen in your name, click here. 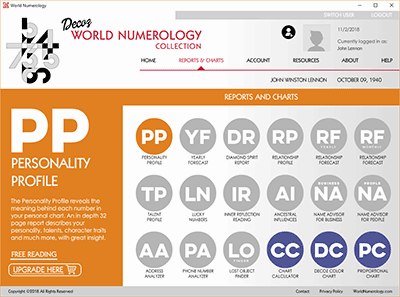 The World Numerology App requires an internet connection. Please make sure your Wi-Fi is working properly. If your Internet connection is a little slow, it may take as much as 30 seconds for the app to load. If this is not the problem, log out of the app by clicking on the LOG OUT link at the top right of the apps window (do not just close the app, be sure to log out). Log back in with your email and password. If you are still having problems, please contact us at 2worldnumerology@gmail.com. A hyphen or an apostrophy used in the name can cause a white screen. If you suspect this may be the case, please contact us at 2worldnumerology@gmail.com. Include the email address and user name. A refund must be requested within 7 days of purchase. The Primary subscription (Personality Profile and Yearly Forecast) is nonrefundable since it is a one-time report that can be copied. The Full subscription refund is your purchase amount minus the cost of the Primary subscription.